(Bloomberg) -- It was case of speaking softly and carrying a big stick. Moody’s Investors Service’s brief comment on South Africa’s credit rating sparked the rand’s strongest rally in five months on Monday and drove government bond yields to the lowest since May. More importantly, it bought President Cyril Ramaphosa more time to convince investors he has the ability to introduce reforms that would stimulate the economy, consolidate government spending and reduce corruption in Africa’s most industrialized economy. The rating company on Friday deferred a scheduled review of South Africa’s creditworthiness, saying only that the ratings weren’t updated and that the next assessment is set for Nov. 1. That meant the country will retain its only remaining investment-grade rating until after general elections on May 8, which could determine the direction of government policy as Ramaphosa battles populist factions within his party. A downgrade by Moody’s could have seen South Africa booted out of investment-grade bond indexes including Citigroup Inc.’s World Government Bond Index, which would have sparked forced selling of a much as $1 billion of the debt, according to Nomura International Plc. 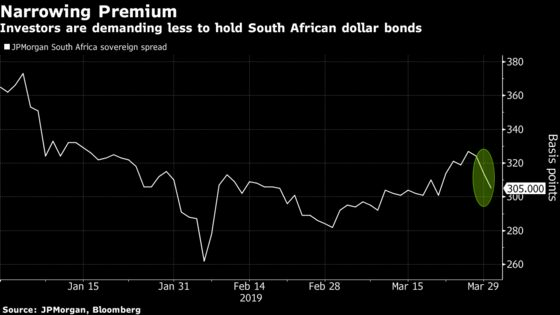 Instead, South Africa may now ride a wave of improving investor sentiment by tapping into the Eurobond market for the first time in nearly a year. Appetite for African debt sales is thriving amid a dovish tilt from the world’s largest central banks, with investors placing orders for more than six times the amount on offer in Ghana’s recent deal. South Africa last issued Eurobonds in May, when it sold $2 billion of notes maturing in 2030 and 2048. Yields on the country’s 2028 dollar bonds dropped nine basis points on Monday to 5.1 percent, the lowest in a year and compressing the spread over comparable U.S. Treasuries to 301 basis points. The National Treasury said in February it would tap international markets for as as much as $2 billion should conditions be favorable. The rand gained 2.4 percent to 14.1601 per dollar by 4:55 p.m. in Johannesburg. Yields on benchmark 2026 rand bonds fell 13 basis points to 8.47 percent, the lowest since May. Returns on the country’s 2028 dollar securities dropped nine basis points to 5.1 percent. An index of South African bank stocks gained 3.7 percent, the most in five months, as the stronger rand and bonds reduced borrowing costs. Standard Bank Group Ltd., the country’s biggest lender, climbed 4.5 percent. Among other financial shares, insurance giant Sanlam Ltd. advanced 4.1 percent, while Coronation Fund Managers Ltd. rose 7.3 percent. The benchmark index was 1.3 percent higher.